The term "EPNS" stands for electroplated nickel silver. This is a process by which a very thin layer of silver is applied to a nickel base electrochemically. Still employed in modern times, it was introduced in the 1840s, replacing a mechanical plating process known as “Sheffield plate,” which in turn was developed as a cheaper alternative to solid silver items. EPNS can usually be distinguished from solid silver and Sheffield plate through markings and patterns of wear. Look first for any markings on the item. EPNS items will usually be stamped “E.P.N.S.,” “E..P” for electroplate or “A1” for highest quality. The presence of any of these marks is a sure sign that the piece is made from EPNS. Inspect the piece for a grimy, dulled area and rub a tissue over it. Silver oxidizes in the atmosphere, causing a loose black residue. 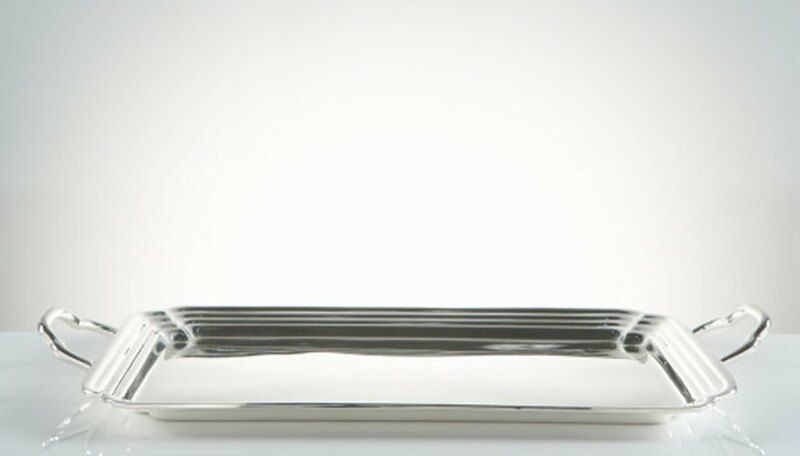 On unpolished solid silver and Sheffield plate, this effect is very evident and the tissue will come away with a streak of grime. The effect is much less marked on EPNS; dirt tends to be pitted and ingrained. The tissue should therefore stay more or less clean. Search the piece for any areas of wear, paying particular attention to edges and any raised decoration. Because it is so soft, on solid silver wear will take the form of a flattening out of details, but there are no variations of color. On EPNS, the surface layer of silver is eventually scoured away, revealing the pale yellow color of the nickel underneath. This contrasts with worn Sheffield plate, where you will see the nutty color of a copper base.